Are you struggling to read and memorize the Qur’an with correct recitation? 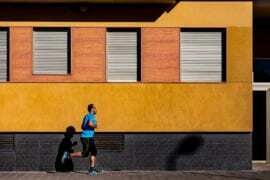 Do you want to track your progress and stay motivated? Do you hope to get a basic understanding of what you’re learning? Read on, Quran Star app may be the right tool for you! Created by the developer Araboh, the Quran Star app is described as “an engaging and innovative app that allows you read, learn and memorize the holy Quran”. I was given the opportunity to take it out on a test run and here are my experiences. When I first opened the app, I was asked to create a profile for myself to track my progress. After filling out my details and spending some time deciding whether my character should wear a pink or orange skirt, I was all set and ready to go Alhamdulillah! 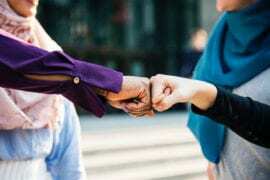 The plus point I found with being able to create a profile within the app was that it facilitated the use for multiple people, each being able to benefit from this app without interfering with one another’s progress. The opening screen gave me the option of choosing surah Al-Fatiha or any surah from the 30th juz’. 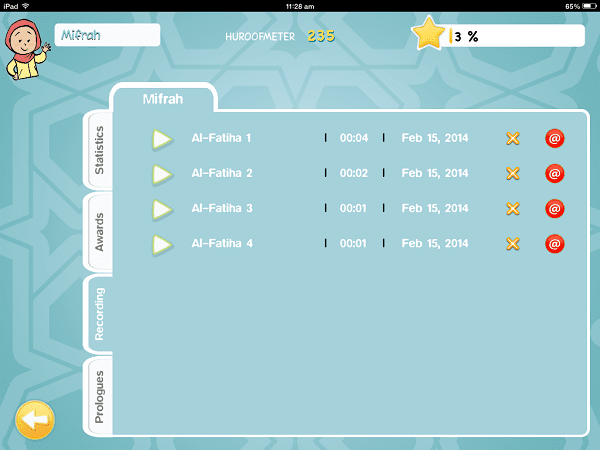 Under each of these surahs, there were three stars that could be awarded as you progress. The first one is awarded after reading the surah, the second after completing a quiz about the surah and the third after memorizing the surah. When learning a new surah, to make sure my recitation was correct, audio recitations were provided. I could choose an adult’s voice, Sheikh Mishary Al-Afasy, or a child’s voice, Yusuf Kalo. On top of that, I had the option of reading it directly from the Arabic text with translations below it or a mus’haf view. The translations provided in this app include English and 8 other languages: Farsi, French, German, Hindi, Indonesian, Malay, Turkish and Urdu. Also, there was an option to view the transliteration for those who cannot read Arabic or are struggling with it, as seen in the screenshot below. After becoming familiar with a surah and stronger in its recitation and memorization, the next thing I did was take a quiz. It required me to arrange the verses from the surah in the correct order. Every time I arranged a verse in its correct order, the stars on the right lit up. If I was unable to complete the quiz, I had the option to go back and revise the surah once again. Once the quiz was completed, I was able to test my memorization using the in-built audio recording and share my recordings with family and friends via email to get feedback from them. This can be done by clicking the red button with the ‘@’ sign. One thing I particularly liked about this app was its rewards element and the motivation it provided. 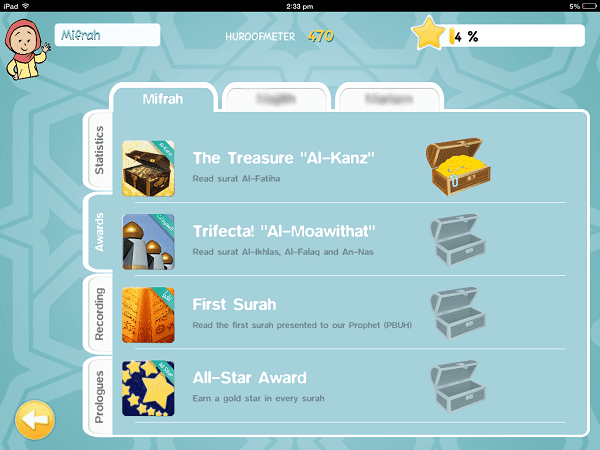 Rewards ranged from stars, in-app rewards such as a treasure chest “Al-Kanz” for reading surah Al-Fatiha, a medal for passing a quiz and a dedication ribbon for spending more time reading Qur’an using the app. My favorite was the ‘huroofmeter’, which tracks the total number of letters read. This is inspired by the following hadith of Prophet Muhammad : “Whoever recites a letter from the Book of Allah, he will be credited with a good deed, and a good deed gets a ten-fold reward. I do not say that Alif-Lam-Mim is one letter, but Alif is a letter, Lam is a letter and Mim is a letter.” [At-Tirmithi]. Another feature that caught my eye was the easy-to-read prologues containing background information about each surah. This is a great way to get children (and adults!) into the habit of learning what they have memorized, and make it part and parcel of their Qur’an learning because after all, the Qur’an has been sent down to us, so we may understand it. The main downside is that it contains only juz’ ‘ama (30th juz’) and surah Al-Fatiha. This makes it perfect for beginners. However, for those wanting to learn other commonly recited surahs such as surah Al-Mulk and surah Yaseen or even memorize the entire Qur’an, Quran Star is not for them. Furthermore, the recitations in this app are only limited to two voices, those of Sheikh Mishary Al-Afasy and Yusuf Kalo, and even though translations are provided in various languages, the app itself and its instructions are available in English only. The Quran Star app costs $2.99 and can be purchased from the iTunes store to be used on your iPad, iPhone or iPod. 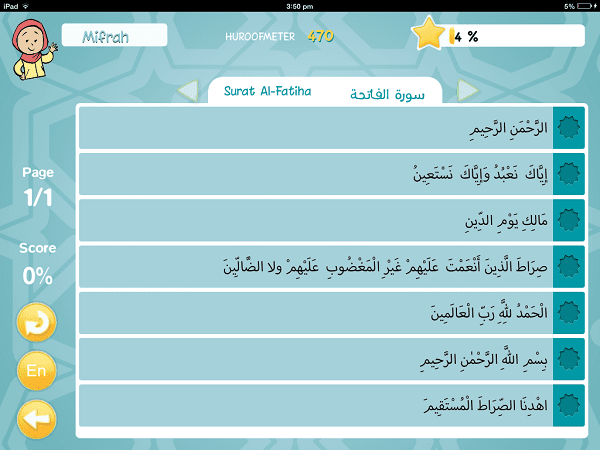 For more information about the Quran Star app, you can check out the website here: http://www.quranstar.com. If you are interested in an Android version, then express your interest on their website. The Quran Star is a well-designed and valuable app that gives users a fun, interactive and engaging way to learn the Qur’an. I would recommend this app to younger users between the ages of 4 and 10; however, older users can still benefit from it. Have you tried this app? What do you think of it? Is there any other app that you would like us to review? Please let us know below!